QMentoring connects undergraduates, from the Faculties of Science & Engineering and Humanities & Social Sciences, with a member of the QMUL alumni community, or a UK-based professional. 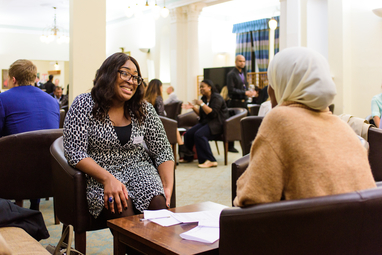 Through these one-to-one relationships, students are supported to make better informed career choices, develop their employability skills, and gain confidence with applying for graduate job roles. Find and apply for work experience opportunities (including shadowing, internships and part-time work). Adhere to the QMentoring Agreement all at times. QMentoring is a programme for undergraduate students who study within the Faculties of Science & Engineering and Humanities & Social Sciences. Due to funder objectives (1), students from these two Faculties, who are in receipt of the QMUL Bursary, will be prioritised for this programme. Students from any year can apply for a place, as long as they are an undergraduate. (1) QMUL is committed to ensuring all students achieve their full potential and has allocated substantial resources to this through the Access Agreement it holds with the Office for Students (OfS). Therefore, a number of student support and progression programmes are targeted at students from groups currently underrepresented in higher education. QMentoring takes place twice a year: October to April and June to December. Applications for our next round will be opening in March 2019, please check back here then for a link to the online form. If you have any questions about QMentoring, please do not hesitate to contact the team by emailing qmentoring@qmul.ac.uk or calling 020 7882 3690.